My name is Alex, and I am a lawyer. I began my first legal job in a large firm in London almost exactly nineteen years ago, and I’ve practiced law in England, France, and the United States. It’s not something that I talk about much on this blog, because (a) this is a blog about writing, mainly, (b) I want you all to like me and (c) being a lawyer is not good blog material, frankly. But something happened yesterday in my so-called “professional” world that I wanted to share. 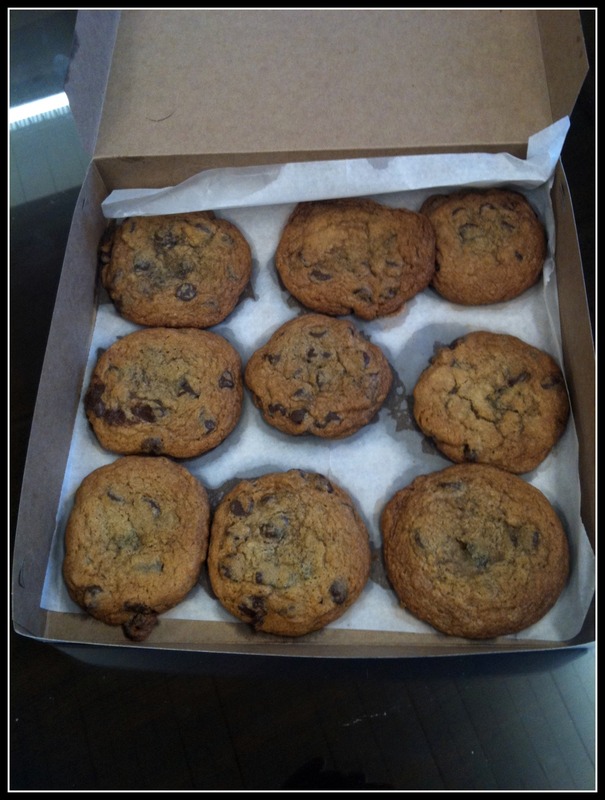 Freshly-baked, hand-made, chocolate chip cookies, still hot from the oven. They were delivered with a little bottle of milk on the side. Talk about something making your day. I had met with a client earlier that afternoon. I am very fond of this particular client. We had spent some time looking at various ways of addressing a problem she had, trying to work out the best way of resolving the issue. After much discussion, I finally got to to the bottom of it, gave her what she needed to move things forward, and that was the business side of matters concluded. Then my client, who knows a little bit about some of the knottier things going on in my personal life, asked me how I was. I wasn’t, I have to confess, prepared for the question. Caught a little off-guard, I’m afraid my usual veneer of professional rectitude slipped somewhat and I opened up more than perhaps I should have. The client listened, wonderfully sympathetically, and offered some warm words of comfort. I was very grateful – it is, after all, my job to provide counsel to the client, not the other way around. I didn’t finish the cookies, by the way. There are some left, and even though they’re no longer warm, they’re still delicious, all the more so for having come from such a rich act of kindness. Even though much of the world appears to be going to hell right now, there are still good, kind people out there. Thank heavens. What a touching act of kindness. Thank you for passing it on. I love this post. Things are not that simple for me. I recieve cookies, and computer script all the time, I guess. I would have a heart attack if anyone brought me actual cookies. And not in a good way. I prefer some warning when company is going to call. Of course that is irrelevant. I like that you seem nice, and I, being 52 years old, and having some experience in love and life, am willing to wager that this person (the one that brought cookies) has a crush on you! Love your posts on twitter. I’m glad you liked the post. Thanks for commenting. Yes, these cookies far preferable to the computer-generated variety, that’s for sure. However, I feel honour-bound to assure you that you would most definitely lose your wager!! !